Van Beuren was an animation studio in Hollywood in the thirties — Frank Tashlin worked there for a bit (he worked everywhere) and created a comic strip character called Van Boring. Until now, what I’d seen of the studio’s output, which lacked the jazzy energy and character of the Fleischer Bros work, seemed to confirm the implied criticism in Tashlin’s choice of name. But this one, MAGIC MUMMY, is kind of nice. 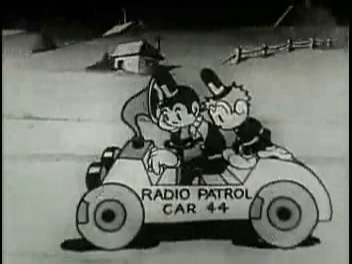 It begins with two cops in a patrol car — they’re rather bland stick figures with smiley-face heads, their design seemingly based solely on ease of reproduction rather than upon any desire to suggest character or humour. But then things get weird as they listen to a musical number over the radio, and we discover it’s being broadcast from their very gay headquarters. Having just watched Mark Rapport’s entertaining documentary THE SILVER SCREEN: COLOR ME LAVENDER, loaned to us by David WIngrove, I was primed to appreciate this material in all its resplendent campery. But more weirdness is to follow. 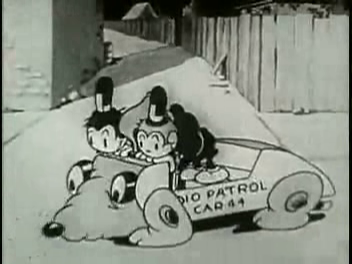 The patrol car now turns into a sniffer dog, because this is a cartoon, and leads the intrepid but unnamed constables (I’m going to call them Larry and Kelton*) into a deserted graveyard overlooked by a ruined building. It’s all very PLAN 9, but twenty-six years earlier. And now we meet the black-robed figure lugging a small sarcophagus. This proves to be a witch, in traditional garb but with the less usual head of a skeletal cow, or possibly dog. I’m picturing Billy Drago for the part in my live action remake. Magicking open a fresh grave, Billy the Dead Cow Witch enters the bowels of the earth — the rest of this cartoon will be a series of descents ever further into Stygian terror, like Lovecraft’s The Color Out Of Space mixed with a Scopitone musical. In his/her PHANTOM OF THE OPERA style lair, Billy Drago telekinetically extracts a bandaged bundle from the casket, and zaps the bandages off to reveal a shapely female in a VERY low-cut gown. Sitting at a piano which appears by the magic of bad continuity, Billy the Witch commands the somnolent lady to “BREATHE!” and breathe she does, bosoms expanding. 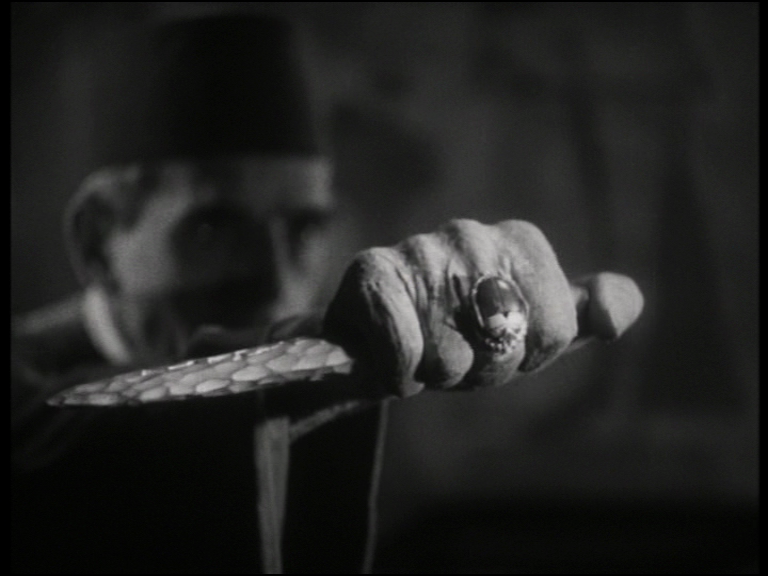 It’s interesting to see elements of PHANTOM, THE MUMMY and witchcraft all bundled together like this, as early as this — the Karloff movie was brand new, but already the iconography had been crammed into a trunk marked “spooky Halloween stuff.” And interesting, now that I think of it, that Hollywood in the thirties did very little to do with witchcraft, as if the implications were too upsetting to religious sensibilities, even though the carnivalesque side of sorcery was celebrated every October 31st with little real controversy. Larry and Kelton , having crept into the crypt, now decide to bust the witch, but are blasted with a cruciato curse which threatens to pull the ink from their bones. Then they’re knocked through a hatch and the witch and mummy descend still further into the subterranean depths, to what turns out to be a theatre. Excellent image of the witch winding up a disintegrating curtain to reveal an audience of skeletons. At a stroke of his/her baton/wand, a skeletal orchestra rises from the earth like the children of the hydra. Now Billy Drago’s darker purpose manifests itself, as he compels his mesmerized mummy companion to take part in a Betty Boop style musical number, interrupted by Larry & Kelton again who have extricated themselves from a drain pipe and snuck onstage. Strange image of Kelton raising the witch’s skirt — for why? — and looking aghast at her tibia and fibula. 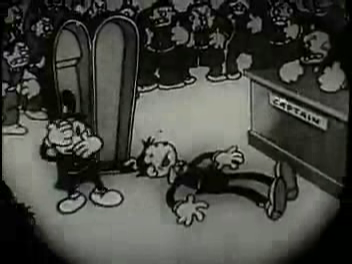 The cops announce a raid and the skeleton audience flees as if caught at a speakeasy. Then there’s a chase into still deeper depths of the earth, a place of stalactites and Clangers-type potholes leading, presumably, to Hell itself. One of those scuffles in the dark that’s so cheap to animate follows, and Kelton, alone and apparently unconcerned as to his friend’s fate, emerges from the graveyard entertainment complex clutching the hard-won sarcophagus and speeds back to police headquarters to show his homosexual cartoon policeman friends. But — oh horror! — when he opens the case it is his buddy Larry who staggers out, his once-circular eyes replaced by the unseeing X’s of Death. Iris in. The End. The moral: don’t pursue bovine skeleton witch’s to underground musical theatres no matter what your sniffer dog car suggests. *But apparently they are called Tom & Jerry. 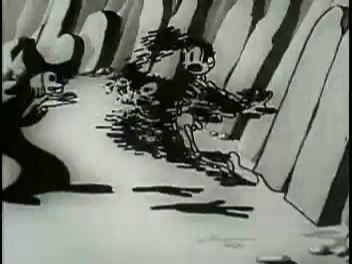 They are the original cartoon T&J, long before that cat and mouse act. 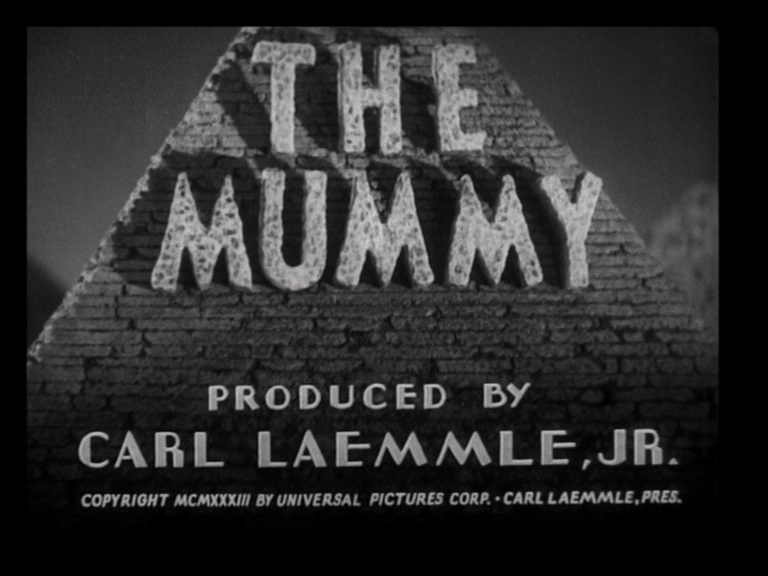 THE MUMMY (1932) is historically unique in being the only Universal horror movie with a main title carved out of waffles. 1) David Manners’ character name here is absurdly apt: Frank Whemple. One just can’t imagine another actor embodying that name so perfectly. 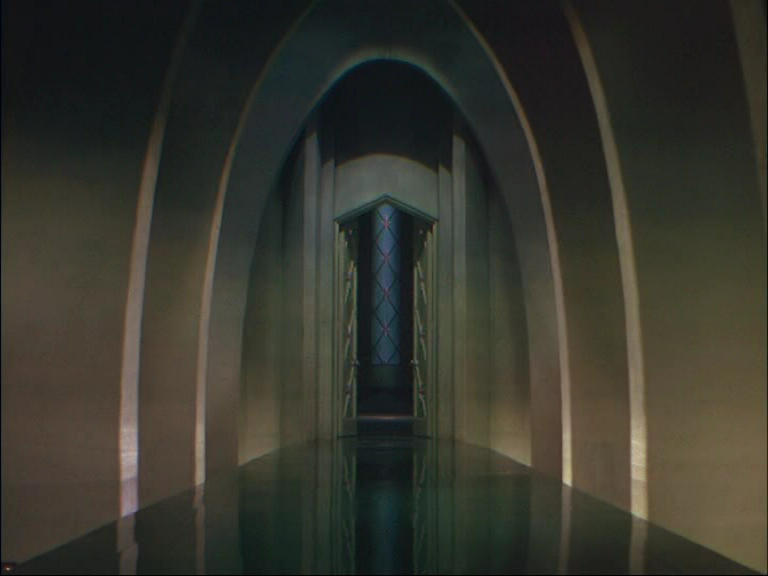 2) I love how Karloff’s magic pool shows him flashbacks of Ancient Egypt without sound — because sync sound is a new development in Hollywood, so obviously they couldn’t have had it in Ancient Egypt. 3) They’ve shamelessly cloned the plot of DRACULA, but it gets even more interesting now that the threat isn’t just foreign, but non-white. The movie becomes a struggle for the soul of the half-English, half-Egyptian Helen Grosvenor (Zita Johann). Obviously, her Aryan side has to win. 4) Helps that Karloff is so thin — he actually has the perfect physique for this, whereas he needed padding out for FRANKENSTEIN. 5) That opening scene — “He went for a little walk” — is really a perfect horror short. It would stand alone without any trouble. 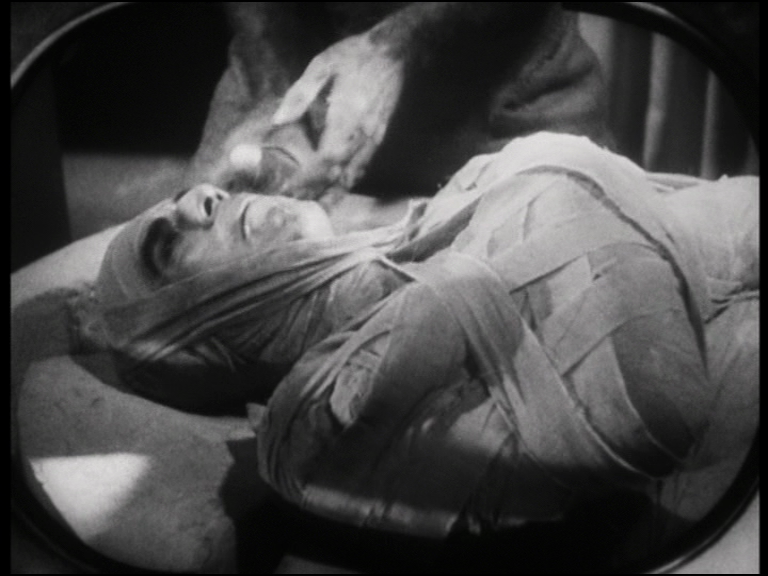 6) Karloff’s mummification scene gave me nightmares, or at any rate disturbed me deeply as a kid, watching the BBC2 Friday night horror double feature. Don’t know if I had actual nightmares, but I was too scared to sleep right away. I guess I saw DRACULA the first week but wasn’t allowed to stay up any later for FRANKENSTEIN. The second week must’ve been THE MUMMY and BRIDE OF FRANKENSTEIN, because I didn’t see the Whale films until a few years later. In week three, though, I saw SON OF FRANKENSTEIN, and found that far more exciting than the two more languid movies I’d thus far experienced. 7) I love Karl Freund’s theatrical lighting changes — where did he get that idea? 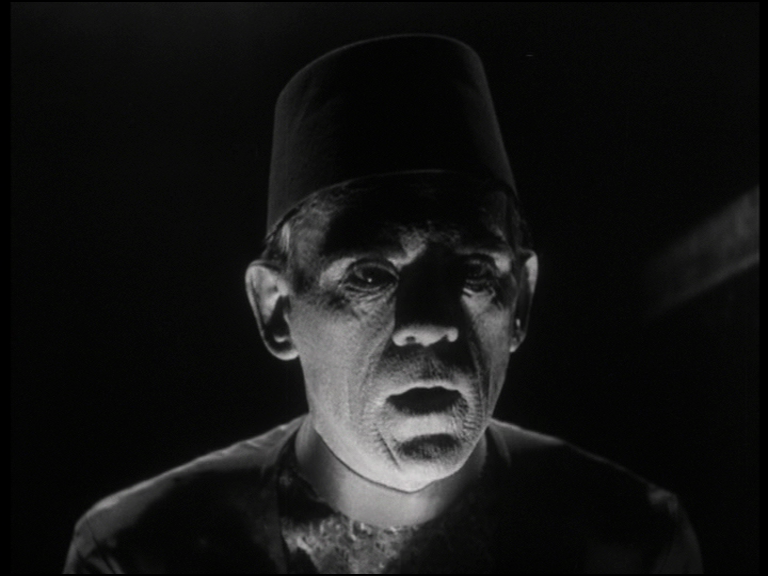 There’s the lighting change on Karloff’s eyes which shows his hypnotic power, and there’s the mood lighting around Boris’s psychic paddling pool. 9) Edward Van Sloan doesn’t seem to be doing his strange quasi-Scottish accent here. Where did a Minnesotan with a Dutch name acquire that posh Kelvinside lilt? 10) Can’t wait to watch the Jack Pierce documentary, but Fiona would kill me if I ran it without her.